Install Visual Commander in Visual Studio 2019. Download Hide Live Share and Feedback in VS 2019.vcmd. 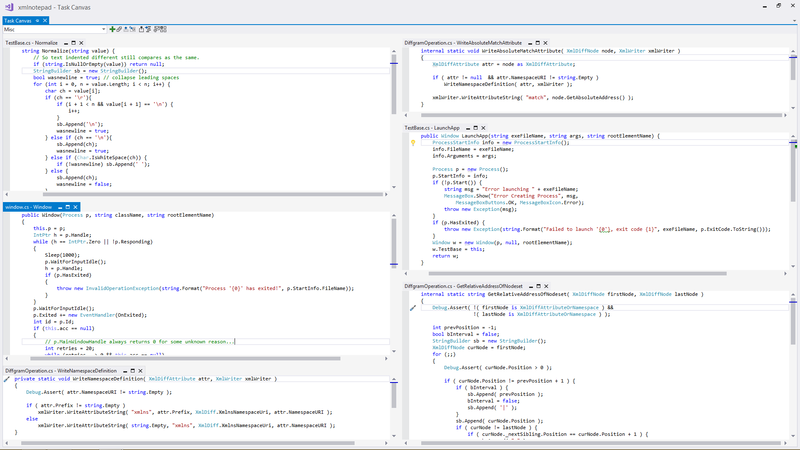 Two weeks before the RTM launch event, Visual Studio 2019 release candidate demonstrates new functionality that may change your workflow currently available with Visual Studio 2017. I’ll demonstrate differences comparing latest Visual Studio 2019 Community RC.2 with Visual Studio 2017 Community version 15.9.9. Start Page also supports customization. For example, BetterStartPage extension replaces the news section by a custom project dashboard where you can organize solutions and projects into different groups for fast access. Start Page: Please give it back! is the open issue in the community forum. Get rid of new Extensions menu is the open issue in the community forum. The dedicated title bar is an easy target for dragging the main window. And it is customizable with the Visual Studio Window Title Changer extension, for example you can add a solution directory to the title or a branch name. Do not remove title bar from Visual Studio 2019 is the “completed” issue in the community forum. 4. Enforced background extensions loading in Visual Studio 2019 adds additional delay to Visual Studio startup time if your work depends on extensions, without clear indication when you can start using them. CreateProjectionBuffer no longer works in VS 2019 is the open issue in the community forum. Participate and vote on Visual Studio Developer Community forum to attract more attention from Microsoft, Visual Studio extension developers and community members to the important issues! By default, when you expand or collapse a method or a code region in Visual Studio, this action is pushed on the undo stack. It ruins any normal code editing cycle – you do text changes, browse code doing folding/unfolding and now your undo stack is full of unrelated outlining operations, need to press Ctrl+Z multiple times to undo a change. I’ve created the new Disable Outlining Undo extension that excludes expanding and collapsing operations from recording to the undo/redo stack in Visual Studio 2017/2019. The Task Canvas extension lets you work with multiple code fragments without switching tabs. v2.0.0 adds the “Move to Other Task” context menu command, removes horizontal and vertical scrollbars from code blocks. Full support for Visual Studio 2019 is blocked by the following issue: CreateProjectionBuffer no longer works in VS 2019. Code Bubbles research in 2010 demonstrated how seeing a sizeable number of functions concurrently can significantly reduce a task completion time by minimizing navigation interactions, offloading limited working memory, comparing and understanding functions together, seeing calling relationships, improving ability to multi-task and to recover from interruptions (paper). In 2016 I personally became tired of switching back and forth between tabs and jumping from place to place within a file. I wanted to see all code fragments I’m currently working on at once. In May 2016 I released Task Canvas for Visual Studio 2015/2017. This approach still allows occasional manual adjustments to change order of blocks by dragging and change block height by clicking Maximize or Minimize. A maximized block uses more space reducing other blocks to minimized state with only 5 visible lines. When several blocks are maximized, they equally share available space.